Diabetes mellitus in cats is an increasing common problem, and it is estimated that around 1% of cats in the Australia suffer from this disease. Diabetic cats cannot regulate their blood sugar levels, which results in a very high level of glucose in the blood (known as hyperglycaemia). Common clinical signs include lethargy, increased drinking and urination, and weight loss despite an increased appetite. It is highly linked to obesity, so if your cat is overweight now is a good time to start his diet – you could help prolong her life! Diabetes is a serious disease, that without treatment can lead to chronic problems and even death in cats. However, with proper diagnosis and long term treatment, many cats can continue to live a good quality of life. The best long term results come when the disease is caught early, in those cases there is even a chance of remission. 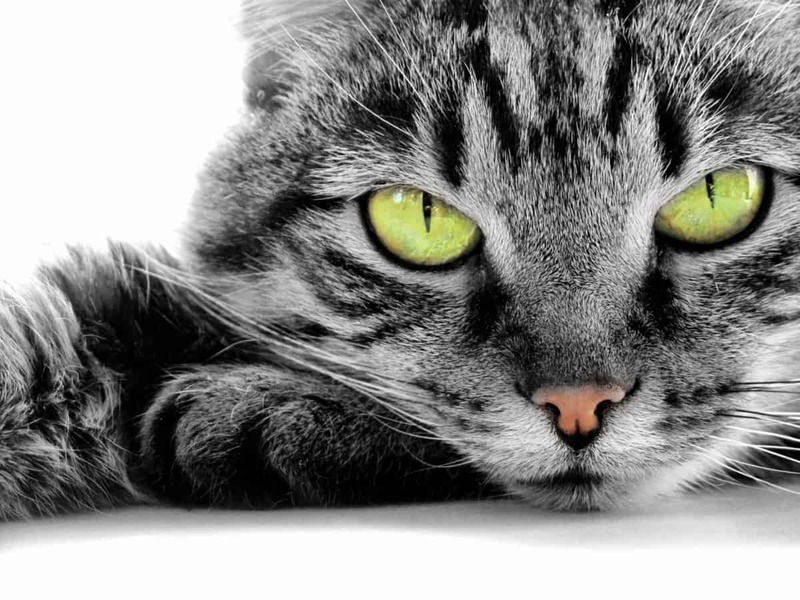 In this article we will take an in-depth look at the background of feline diabetes mellitus, the clinical signs and the current diagnosis and treatment options for managing this common feline disease. Just like in the human body, all the cells in the cat’s body require glucose for their energy needs. The pancreas is a small, flat organ that produces the hormone insulin. When the cat eats, insulin is secreted into the blood stream. Insulin allows cells to absorb and use glucose, and thereby lowering the levels of glucose in the blood. Glucose is the body’s fuel, and excess amounts of sugar are deposited in the liver and the fat deposits of the body. So, what happens in the body if the cat has diabetes? 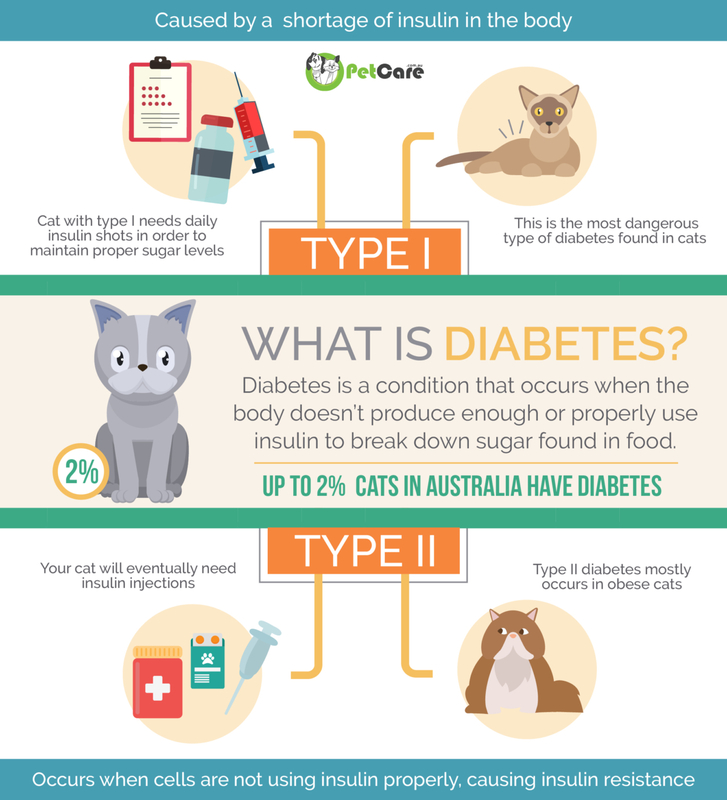 Let’s take a look at two different types of diabetes which can affect cats. Type I or Type II Diabetes? In Type I diabetes, blood glucose concentrations are too high because of a lack of insulin production. If there is not enough insulin, then glucose cannot be absorbed and used by the body. This type of diabetes is uncommon in cats, and is due to the destruction of the Beta cells in the pancreas which produce insulin. In Type II diabetes, blood glucose concentrations are too high because the body does not respond properly to insulin, there is insulin resistance. In this case, there is enough insulin, but the cells are resistant to it. Diabetic cats most commonly have type II diabetes. Although in human diabetes there have been up to five different “types” described, type II diabetes is also more common in people too. Are Some Cats More at Risk Than others? Yes, studies have shown that some types of cats are more at risk of developing diabetes than others. Although any type or breed of cat can develop this disease, studies have found that older, overweight, male cats are more at risk of developing diabetes. The average age for diagnosis of diabetes in cats is around seven years old. Burmese cats have also been found to be at a higher risk of developing the disease too. There is a very high level of glucose in the blood, but the cells can’t absorb and use it as energy. The cells are desperate for energy, therefore they use other sources to get their energy instead, breaking down fats and proteins (muscle) in the body. This leads to weight loss and is one of the most obvious signs of diabetes in cats. Often the owner will notice that despite an increased appetite, their cat seems to be shedding weight. The cat is often quieter, lethargic and with an unkempt coat, as it struggles with it’s energy needs. The clinical sign of weight loss despite an increased appetite, is not unique to diabetes, and although the underlying mechanism is different, it is also a common symptom in cats with an overactive thyroid (hyperthyroidism) too. There is so much glucose in the blood, that the body has to excrete a lot in the urine, through the kidneys. The high concentration of glucose in the urine, causes lots of water to be pulled from the body, into the urine too. This causes an increased urine volume and increased water loss from the body. The cat feels very thirsty, and is at risk of dehydration, as it’s body tries to combat the loss of water in the urine. Although uncommon, when diabetes is not controlled for a long time, the cat can develop nerve damage to the hind limbs. It causes the cat to walk on it’s hocks, known as a “plantigrade” stance. This can lead to sores developing on the limbs, where they rub on the ground. This stance can be corrected if the diabetes is caught early and successfully treated. This can quickly lead to death. It is a serious, emergency complication of diabetes. The body produces ketones, during the process of breaking down fat to produce energy. The ketones build up in the blood stream and cause the blood to become very acidic (known as metabolic acidosis). The body tries to excrete the excess ketones in the urine, which leads to further dehydration. It is a vicious cycle, and this continues until the cat collapses. This is a medical emergency, and the cat needs immediate veterinary care. The underlying reason for a cat developing diabetes is a combination of genetics and lifestyle. Therefore, diabetes might run in a family line of cats. Your veterinarian will perform a full physical examination of your cat, checking things like your cat’s eyes, colour of gums, teeth, heart rate, lungs and skin (among many other things!). Your cat’s weight should be taken and recorded too. They will also ask questions about your cat’s clinical signs at home: Increased thirst? Increased urination? Weight loss? Appetite? Lethargy? After the physical examination and clinical history, the vet may be suspicious of diabetes. However, many similar clinical signs may be caused by other diseases too. Therefore, diabetes is first diagnosed by testing the glucose concentration of the cat’s blood and urine. It is important to test both the urine and blood. However, sometimes the diagnosis by a simple blood test, is not straightforward, due to a cat’s stress response. Cats that feel stressed (as they often do in the vet clinic) often have a higher blood glucose concentration (hyperglycaemia) than normal. This can create a “grey area”, whereby some cats that do not have diabetes, have a temporary elevated blood glucose level. This is why it is important to complete further tests, or else the cat may be misdiagnosed! A sample of blood is taken to check the level of blood glucose. Normal blood glucose concentrations for cats are: 80-120 mg/dl (4.4-6.6 mmol/L). Often this is a quick test, completed using a small hand held glucometer. A urine sample is analysed to check for glucose, often using a dipstick. In a normal cat’s urine there should not be any glucose, even if it has a stress hyperglycaemia. Other things that are often checked in a urinalysis include: proteins, ketones, blood, pH, specific gravity (concentration), and the presence of crystals or bacteria. Fructosamine is a molecule which gives an indication of the blood glucose concentration over the previous 2-3 weeks. Therefore, it is a more accurate way of diagnosing diabetes than a one off blood glucose, which just gives a single measurement in that moment. It is also very useful to measure fructosamine, in a stressed cat, to be sure the glucose elevation is a true reflection of diabetes and not just due to stress. Other diseases can co-exist or even be the underlying cause of diabetes. Therefore, sometimes it may be necessary to complete further tests to rule out other problems. Examples include further blood tests for things such as hyperthyroidism, kidney disease or liver disease. Blood pressure measurement might be taken to check for high blood pressure, and x-rays or ultrasound examination might be undertaken to check the abdominal organs. Most cats require lifelong treatment for their diabetes, usually with twice daily injections of insulin and a modified diet. Regular vet check ups are also important, especially in the initial stabilisation period. Feline diabetes is treated with inject-able insulin. Usually given twice daily, just after the cat has eaten. The oral drugs used in humans, for example Glipizide, are not very effective at controlling diabetes in cats. 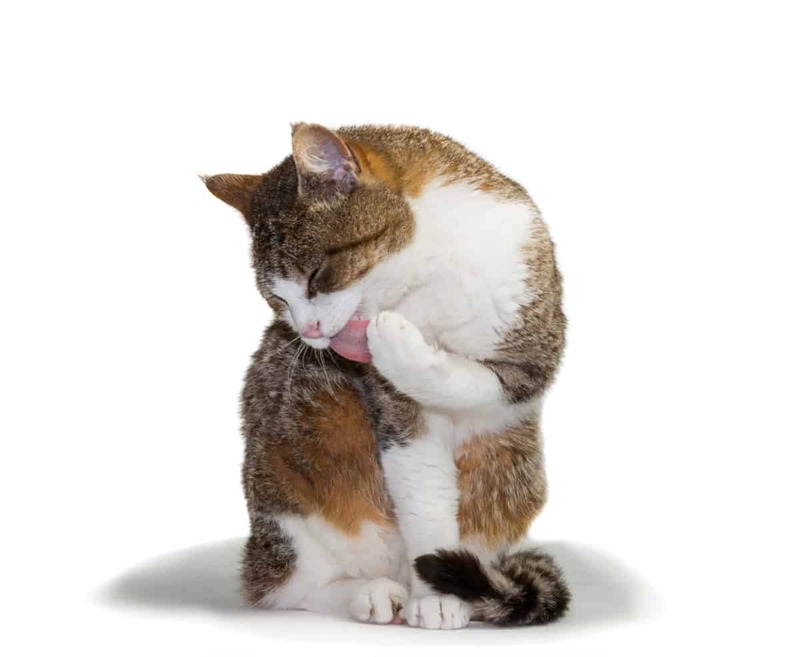 Although many owners are worried about giving regular injections to their cat, they and the cat usually adapt to these injections very well. Normally the needle used to administer insulin is very small and thin, making the injection as painless as possible. Owners are taught how to inject their cat in the veterinary clinic, normally during an extended consultation with a nurse or veterinarian. The injections are given just under the skin, and it is advised to rotate the site used to prevent the skin from becoming thickened. There are a number of different types of inject-able insulin available. Each one has a slightly different duration of effect. Most cats will require an insulin injection every 12 hours. 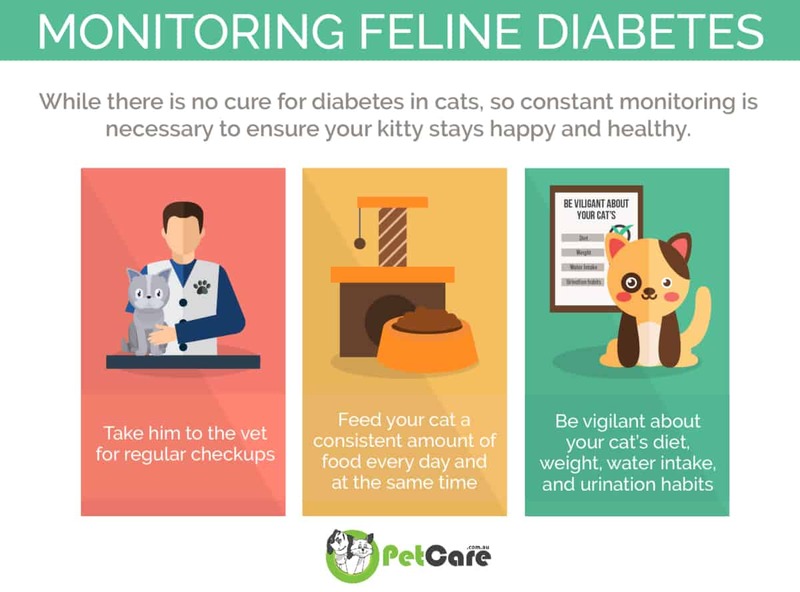 Once a cat is started on insulin therapy, it will require regular blood glucose monitoring to check the cat is responding to the medication and to ensure the blood glucose concentration doesn’t fall too low (Hypoglycaemia). 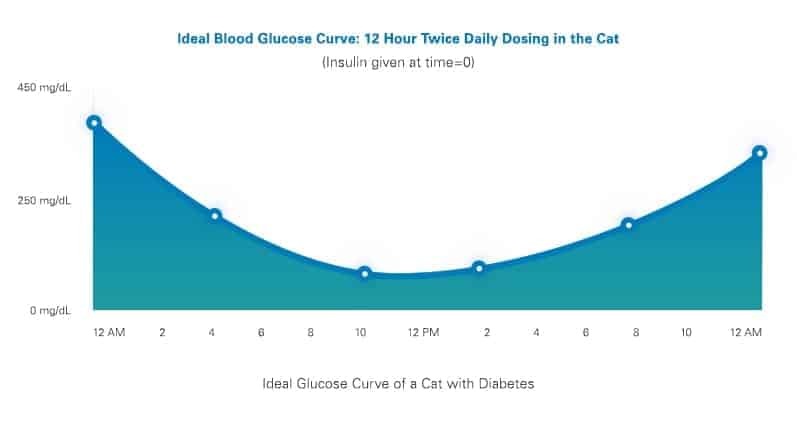 Previously blood glucose curves were often performed in the vet clinic, taking regular blood samples over a period of 12 hours. However, as you can imagine these are pretty stressful for cats and now this monitoring is best achieved with testing the blood glucose levels of the cat at home, using specialised blood glucose kits (Glucometers – costing $40–100) that owners can use. It is often recommended to feed a diabetic cat, a high protein and restricted carbohydrate diet. This helps to maintain lean muscle mass, while reduce body fat. Recent studies have shown that restricting carbohydrates can improve the overall control of blood glucose levels in cats with diabetes and reduce the amount of insulin they require daily. There are some specially formulated complete feline diets for diabetic cats, such as RoyalCanin Feline DIABETIC or Hills m/d Feline. Diabetic cats that are underweight will need to slowly build up their body weight again. This may involve extra feedings or just a more nutritionally dense food. Obese cats with diabetes will be advised to start a slow weight loss programme. Obesity is linked to insulin resistance, so if the cat starts to lose weight while treating the diabetes, the diabetes may start to slowly improve and sometimes the cat even goes into remission. Any change in diet needs to be done slowly as the initial phase of treatment may be stressful with regular visits to the vet and the introduction of insulin injections. It is important to work closely with the veterinarian or a certified animal nutritionist. Yes, remission is possible in cats with diabetes! 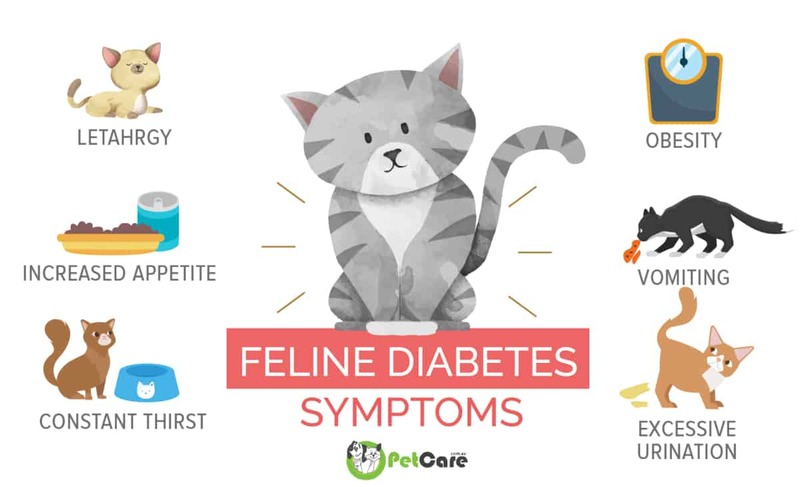 However, if you are an owner of a cat with diabetes do not get your hopes up too high, it is still a disease that is more likely to be controlled rather than cured. Diabetic remission is when a cat no longer requires insulin therapy and maintains a normal blood glucose level for more than four weeks without insulin treatment. Not all diabetic cats can or will go into remission. It is more likely if the diabetes is caught early, treatment is started promptly and the cat is closely monitored. Diet is also an important factor, with cats more likely to go into remission if they stick to a low carbohydrate diet. One study found that if a cat had good glucose control within 6 months of diagnosis, it had a 60- 80% chance of remission. In comparison the study found that cats that started insulin therapy more than six months after diagnosis, they only had a 30% chance of remission. However, often remission is not permanent, with around 30% of of diabetic cats in remission having a relapse. Those cats that do relapse and require insulin therapy again, are highly unlikely to go into remission again. Diabetes is a common problem for the ageing feline population. While diabetes is a multi-factorial disease, there is a strong link with feline obesity and insulin resistance in the body. Therefore, it is important to keep cats active and at a healthy weight. While the disease is quite straight forward to diagnose, there may be other co-existing problems which need to be ruled out too. Feline diabetes does require owner commitment due to the regular vet check ups, constant monitoring and strict treatment schedule. However, with proper support and education from their vet clinic, most owners manage just fine. 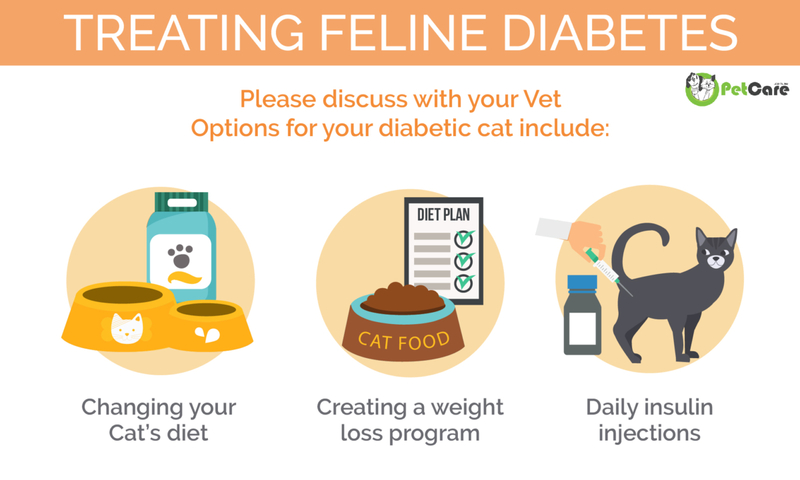 Many cats with well controlled diabetes will continue to live a long, good quality life. Remission is possible, and is more likely if the diabetes is caught early, proper treatment initiated promptly and the cat is maintained on a low carbohydrate diet. 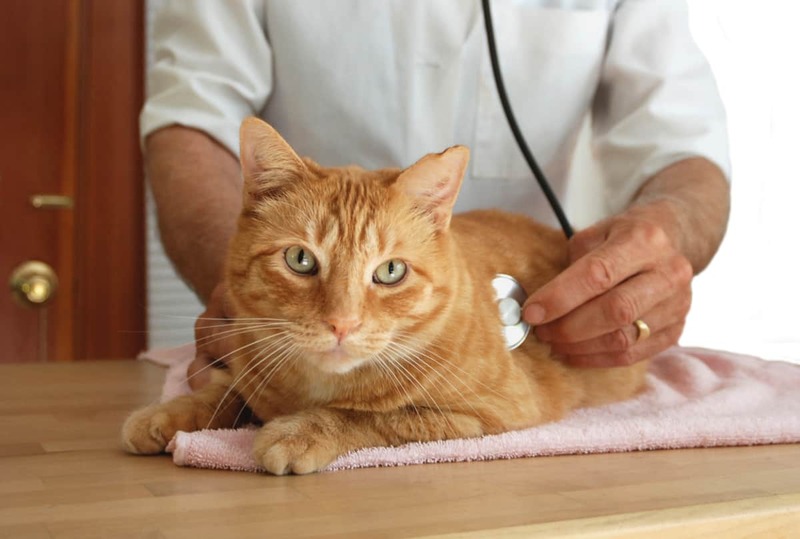 Regular six monthly vet checks, especially in middle aged to older cats, is a good way to monitor your cat’s health and catch certain diseases early in the process. American Diabetes Association Diagnosis and classification of diabetes mellitus. Diabetes Care. 2014;37(Suppl 1):S81–S90. Rand JS, Bobbermien LM, Hendrikz JK, Copland M. Over representation of Burmese cats with diabetes mellitus. Aust Vet J. 1997;75(6):402–405. Zoran DL, Rand JS. The role of diet in the prevention and management of feline diabetes. Vet Clin North Am Small Anim Pract. 2013;43(2):233–243.